The bloc has a role in keeping the regional peace, but it must overcome its tendency to paralysis. 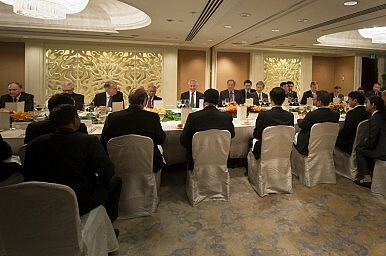 At the annual Shangri-La Dialogue meeting of regional defense ministers over the weekend in Singapore, the two great democratic powers in East Asia – the United States and Japan – in referring to China’s behavior reaffirmed their opposition to the use of intimidation and force in settling maritime disputes in the region, opposed “unilateral attempts to change the territorial status quo” through coercion, and insisted that all claims should be settled through recourse to international law. These are hardly novel sentiments but reflect standard diplomatic fare long pushed by the Association of Southeast Asian Nations (ASEAN) – something Japanese Prime Minister Shinzo Abe and American Secretary of Defense Chuck Hagel both acknowledged. But while ASEAN-led forums remain the clearinghouse for regional ideas and debate on security issues, the organization could be drifting toward slow, albeit dignified, irrelevance. When it comes to helping manage China’s rise peacefully, ASEAN’s first problem is one of declining relative scale and size. When China became a full ASEAN Dialogue Partner in 1996, military spending by China was a little over 1.3 times that of the combined defense budgets of the ASEAN nations. By the end of 2013, Chinese spending was almost five times more than that of ASEAN’s. This is significant. Back in the 1990s, a relatively weaker and strategically isolated China was still attempting to convince the region of its “peaceful rise,” a term Beijing formally adopted in the middle of the previous decade. ASEAN was a useful instrument through which China could demonstrate that it did not intend to challenge the post-World War Two order and behave according to regional diplomatic norms. Contrast that with Beijing’s current preparedness to alienate every maritime power in Asia, triggering a renewal and reinvigoration of the America-led alliance system in Asia. Southeast Asian maritime states are moving closer to each other, and other naval powers such as Japan and India, strategically and militarily. The region is even cautiously welcoming the Japanese desire to play a more expansive and active role in regional strategic affairs. It could be that Beijing’s reach could well be beyond its grasp. But it is clear that China’s attitude to ASEAN has changed. Once seeing ASEAN as a vehicle to advance its diplomatic interests, Beijing now seeks to neutralize ASEAN in order to advance its strategic and territorial interests. Nowhere is this more evident than China’s go-slow on a binding Code of Conduct that would prohibit the use of force in settling maritime disputes. Although China has ensured that progress is non-existent, engaging in the pretense of negotiating allows China to claim that its diplomats are seeking a peaceful solution even as it coercively expands and consolidates its de facto control and administration of contested regions. Significantly, non-ASEAN powers such as the U.S., Japan and Australia continue to pay increasingly superficial homage to the ASEAN process, all the while knowing that ASEAN’s insistence on consensus decision-making too easily leads to paralysis. The Joint Statement released by the defense ministers from these three countries over the weekend focused on the importance of strategic and defense cooperation in shaping Chinese behavior, and dissuading China from using coercion to pursue its claims. In the Joint Statement, urging China and ASEAN to reach an agreement on the Code of Conduct was offered more as a passing hope than as a solution. This then has always been the stark reality for ASEAN: that it retains influence and relevance as a regional strategic organization only if it is useful to the great powers. China seems glad about ASEAN’s paralysis, but not yet its demise since paralysis actually serves Beijing’s interest. The equation is different for America and its allies. Although all maritime capitals seek a greater American and allied presence in the region to maintain peace and security, the exercise of authority and power still needs the cover of legitimacy that multilateral organizations such as ASEAN can offer. This then is still ASEAN’s strength. It has the power to acquiescence but also to criticize. This is not immaterial. If it were, Beijing would not have bothered to strong arm Cambodia into blocking a communiqué that would have raised concerns about tensions in the South China Sea at the foreign ministers meeting in Phnom Penh in July 2012. ASEAN also has the power to exclude when it comes to the largely symbolic agreements that it seeks to underwrite. China will ensure that a binding Code of Conduct will remain stalled. But there is nothing to stop ASEAN from signing a declaratory Code that would prohibit the use of force in settling any disputes with other nations in the region such as the U.S. and Japan. China would be invited to do so but would likely refuse. If so, Beijing would be isolated and suffer the diplomatic fallout as a result. As the experience with the Trans-Pacific Partnership trade agreement shows, one must sometimes first exclude China in regimes that include other regional great powers before Beijing is willing to consider sitting at the negotiating table. For ASEAN to play such roles, it would have to abandoning its cherished convention of decision-making by consensus or unanimity, and perhaps allow decision-making through agreement by a quorum of seven or eight member states. Such a change would initially be resisted by many members. But the alternative is paralysis, irrelevance, and continued Chinese manipulation of the organization. And this will do nothing for the five member states and their contested claims in the South China Sea. Dr. John Lee is an Adjunct Professor at the University of Sydney and a senior fellow at the Hudson Institute in Washington D.C. He was part of the Australian non-governmental delegate at the Shangri-La Dialogue in Singapore.